Do you remember the terrariums of the 1970s? They were often glass or plastic spheres, orbs, or giant brandy snifters, sometimes complete with macramé hangers! Today’s terrariums are made in a variety of shapes and sizes, often with mirrored backs and sides to increase the visual presence of the plants within them. The precursor to the terrarium was developed years ago (c. 1829) when Dr. Nathaniel B. Ward, an English physician with a passion for botany and entomology, discovered he could germinate spores of a desirable fern within a closed glass jar. He designed what is known as the Wardian case, a glass-topped box, resembling a miniature greenhouse, that was used to transport plants collected in distant countries back to the British Isles. Within the glass enclosure he could grow plants in conditions almost like those of their natural environment and protect them from the coal smoke-polluted air of London (Fig. 1). Because the plants inside their glass enclosures were decorative, the idea was soon adapted for home interior decorating. A terrarium, a garden in an enclosed glass or plastic container, is a delightful way to grow a collection of small plants. With proper care, a terrarium will create a humid atmosphere that protects tender, tropical plants that are difficult to grow otherwise in the dry atmosphere of our homes. 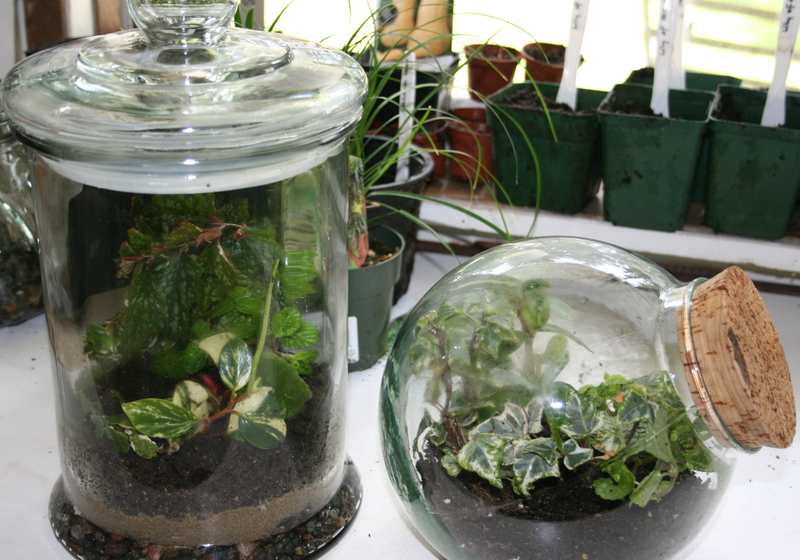 Under controlled conditions, a terrarium can also be used to help start new plants from seeds and cuttings. Figure 1. A Wardian case for transporting and maintaining plants. Select a container of clear, colorless glass or plastic. Avoid translucent or colored glass or plastic, as it will limit the quantity and quality of light available for photosynthesis by the plants inside. The container need not have a top, as one can easily cover the container with clear, colorless plastic food wrap. (As a fun experiment with children, you may want to wrap the entire container in colored plastic food wrap to see how compromised quality of light affects plant growth.) Aquariums, gallon-size jars, spheres, decorative containers, and pop bottles are readily available and easy to transform into terrariums. Good potting medium, purchased from a local garden center, is ideal for terrariums. It is not recommended to use garden soil, as it is too heavy and does not provide adequate aeration or capillary movement of water. Garden soil likely contains weed seeds, insect eggs, and disease-causing organisms. Commercial potting medium typically is a mixture of peat moss with perlite, vermiculite, and/or composted bark, forming a substrate that provides excellent aeration as well as moisture retention. Commercial potting medium has been pasteurized, killing weed seeds, insect eggs, and disease-causing organisms. Commercially prepared potting media usually have a starter charge of fertilizer already added to the mix; therefore, additional fertilizer is not needed at the time of planting. Other materials such as rocks, sand, or charcoal are not recommended for drainage as once believed. When layers of such material are used in terrariums, water drainage away from roots is actually hindered. The reason for this is that the potting medium is like a sponge with millions of air pockets. When wet, the water is held tightly until the potting medium becomes completely saturated. Only then will the water move to the next layer. By then, there is too much water even for the drainage layer to hold. The plants’ roots suffocate in the oxygen-depleted potting medium, rot, and eventually die. Although many varieties of plants can be grown in a terrarium, one should choose plants that are naturally dwarf, slow-growing, tolerant of high humidity, and tolerant of the low to medium level of light where the terrarium is going to be placed. Choose plants of various textures and colors or shades of green to maximize the visual interest. Suggested plants for use in a terrarium are listed at the end of this publication. Cacti and succulents are not well-adapted to growth in a terrarium, as it will be too humid. For these plants, a dish garden would be a better choice. 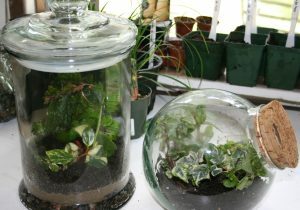 A terrarium can be used to grow a specimen of a given plant, or it can be planted with a variety of plants. Consider where the terrarium will be displayed and how it will be viewed. If it can be viewed from all sides, then plan to place taller, vertical plants toward the center with shorter, rounded or prostrate plants around the perimeter (Fig. 2). 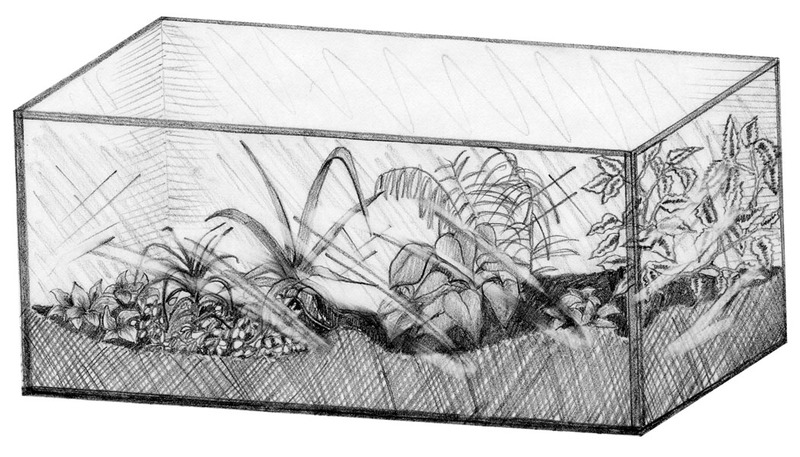 If the terrarium will be viewed from one side, plan to place the taller, vertical plants toward the back with the shorter, rounded or prostrate plants toward the front and sides (Fig. 3). Wash the container, inside and outside, with warm soapy water. Be careful, it can become very slippery! Rinse the container with cool water several times to remove all traces of soap and then dry thoroughly. To create good visual proportion with the container, add slightly moistened potting medium to a depth of ¼ inch for every inch width of the container; however, it is not necessary to exceed 3 inches deep, except to create a visual berm. Varying the depth of the potting medium provides additional visual interest, and natural rocks and stones can be added to the surface to complete the miniature plantscape. Gently remove the plants from their pots, avoiding damage to their root systems. Plant the taller, vertical plants first to the same depth they were growing in the pots just removed. Continue planting the shorter, rounded, or prostrate plants as you move away from the taller plants. Use caution not to crowd plants against one another or against the walls of the terrarium. Gently adjust foliage of the plants to drape naturally. Add small amounts of water from a spray bottle set to a coarse stream or from a drinking straw dipped into water to rinse potting medium off foliage and off the inside of the terrarium’s walls. Avoid getting the foliage too wet, as it will not readily dry in the terrarium, and could become infected by water-borne bacteria or fungi. Also, be cautious not to overwater the potting medium; it should be moist but not wet. If too much water is inadvertently added, tilt the terrarium so the water forms a pool at its edge and then use a paper towel to wick the excess water away from the potting medium. Wipe the inside walls of the terrarium dry with a soft cloth or paper towel to avoid leaving water spots and then cover with the container’s lid or a piece of clear, colorless plastic food wrap. Figure 2. 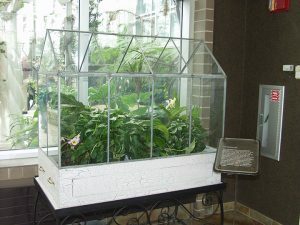 Larger plants can be used as a focal point in the center of a terrarium to be viewed from all sides. Figure 3. Larger plants or elevated plants provide a strong backdrop for a terrarium plantscape to be viewed from one side. Place the terrarium in the bright light of a window; however, avoid direct sunlight, as it will quickly overheat the terrarium. For more information about plants’ need for light, see OSU Extension Fact Sheet HLA-6401 Growing Under Lights. It may take a few weeks to establish a “rain cycle” within the terrarium. It is not unusual for the walls of the terrarium to fog the first few days. It may be necessary to partially open the top or briefly remove the lid of the terrarium to vent excess humidity, replacing the cover once the condensation evaporates. The rain cycle results from careful management of the water in the terrarium. 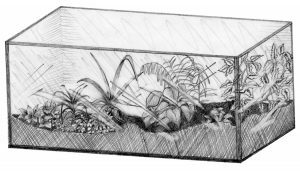 Eventually, rather than forming a fine fog on the interior surface of the terrarium, water will condense in a light film and, then, trickle down the sidewalls back into the potting medium. The established terrarium will require additional water only infrequently. In order to minimize the plants’ outgrowing the terrarium, keep fertility low. Use a fertilizer labeled for houseplants at half the recommended rate and half the recommended frequency. For example, if the fertilizer label recommends “1 teaspoon per gallon applied twice per month,” apply “½ teaspoon per gallon once a month.” If nutrient deficiency symptoms appear (chlorotic foliage, for example), increase the rate or apply more frequently. The miniature plantscape of a terrarium can be expected to remain visually in proportion to the container for about one year; however, periodic pruning of aggressive or fast-growing plants may be needed to maintain an aesthetic appearance. For more information on the subject discussed in this publication, consult your local Oklahoma Cooperative Extension Service office. This list is not intended to be exhaustive; there are many other dwarf, slow-growing plants suitable for a terrarium. Always select dwarf or miniature varieties. Asparagus Fern – Asparagus spp. Boxwood, Japanese – Buxus microphylla cvs. Cast Iron Plant, Miniature – Aspidistra elatior cvs. Chinese Evergreen, Dwarf – Aglaonema spp. Ferns – Adiantum spp., Pellaea spp., Pteris spp. Meadow Beauty – Sonerila spp. Earth Star – Cryptanthus spp. Geranium, Miniature – Pelargonium spp. Joseph’s Coat – Alternanthera spp. Peperomia, Miniature – Peperomia spp. Primrose, Miniature Cape – Streptocarpus spp. Strawberry, Wild – Fragaria spp. Violet, Flame – Episcia spp. Ivy, Dwarf English – Hedera helix cvs. Ivy, Miniature Swedish – Plectranthus spp. Moss, Club – Lycopodium spp. Moss, Little Club – Selaginella spp. Wandering Jew – Tradescantia spp.